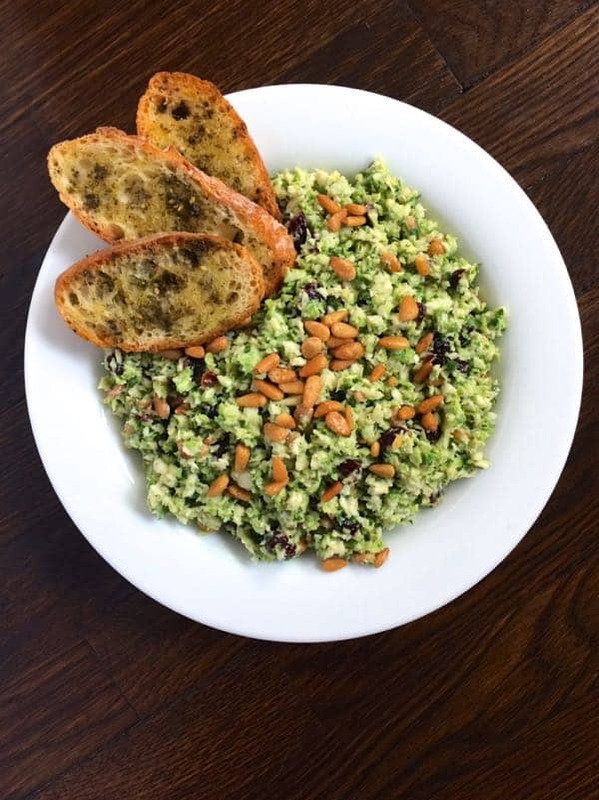 Tossed in a creamy tahini garlic dressing and mixed with dried cherries and toasted pine nuts, Brussels sprouts have never tasted so good. Confession: I will eat just about anything smothered in tahini. If you’re not familiar, tahini is a paste made from sesame seeds. You can find it in most grocery stores, ethnic markets and online. 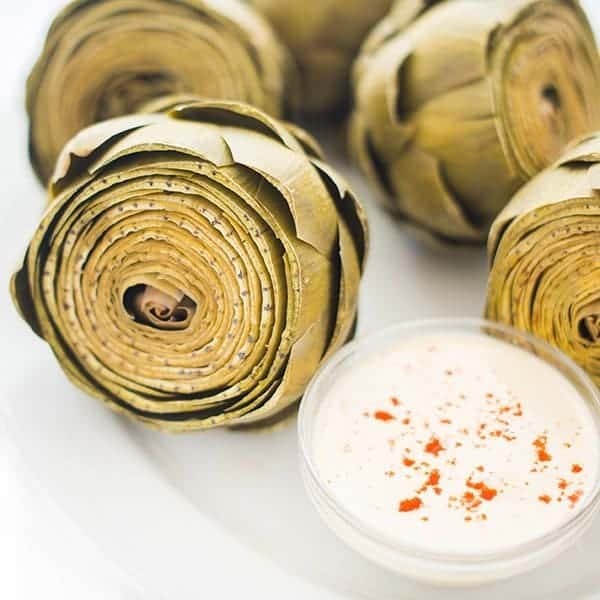 Growing up, my mom would use it to coat roasted fish but it also tastes delicious with chicken shawarma in a pita or as a dipping sauce with roasted vegetables. Speaking of vegetables, Brussels sprouts are in season and are at their peak flavor right now. While I normally love my Brussels roasted with lots of bacon, I decided to give them a quick blitz in the food processor and turn them into a raw slaw with a creamy tahini, garlic and lemon vinaigrette. 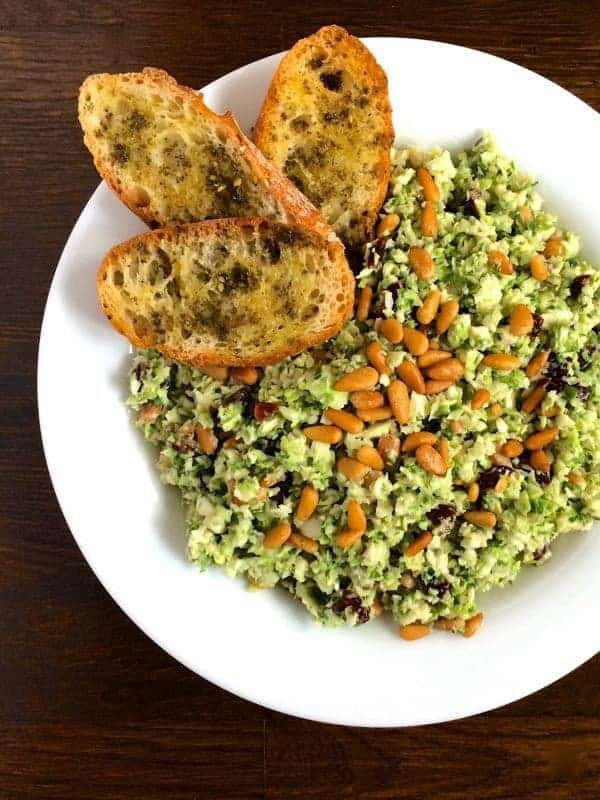 Since today is a special occasion, I decided to serve this Brussels slaw with an addictive little crostini made with olive oil, salt and a good pinch of earthy za’atar. Wondering what we are celebrating? Jessica of How Sweet Eats is expecting her first baby and the blogging world is coming together to celebrate in a BIG way. I’m sure Jessica doesn’t need an introduction but if you’re not familiar with her blog, you must check it out. Literally, Jessica has never shared a recipe that I didn’t want to cook and eat immediately. If the thought of raw Brussels makes you want to run for the hills, I urge you to reconsider. 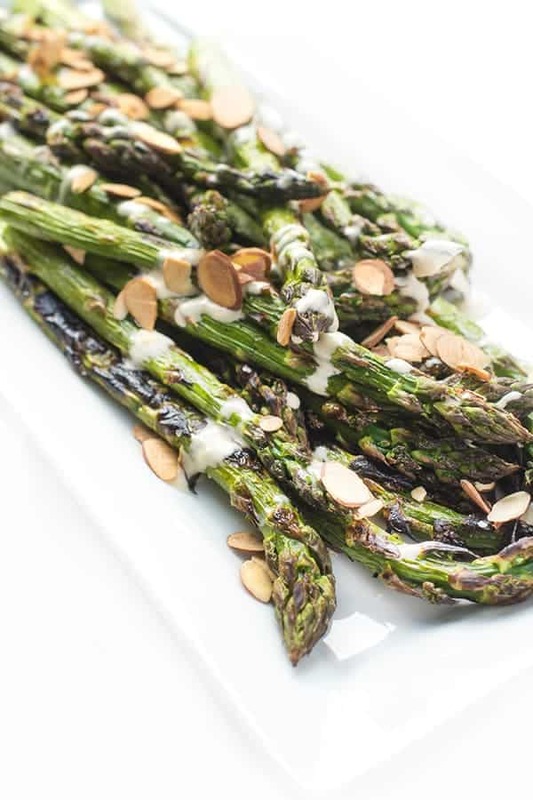 The acid in the lemon juice breaks down the raw-ness and the creamy, luscious tahini and addictive garlic totally sends it to the next level. Of course eating it on a crispy za’atar crostini doesn’t hurt either. Pre-heat oven to 350 degrees and toast pine nuts on a baking sheet until golden brown, 5-7 minutes; set aside. 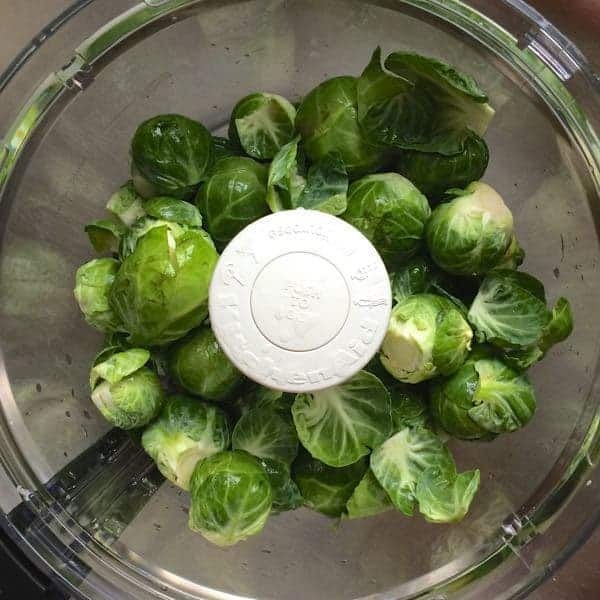 Remove the stems and halve Brussels sprouts then place in a food processor. Pulse until roughly chopped or use the slicer attachment to thinly slice. Alternatively, you can use a mandolin or simply thinly slice with a knife. 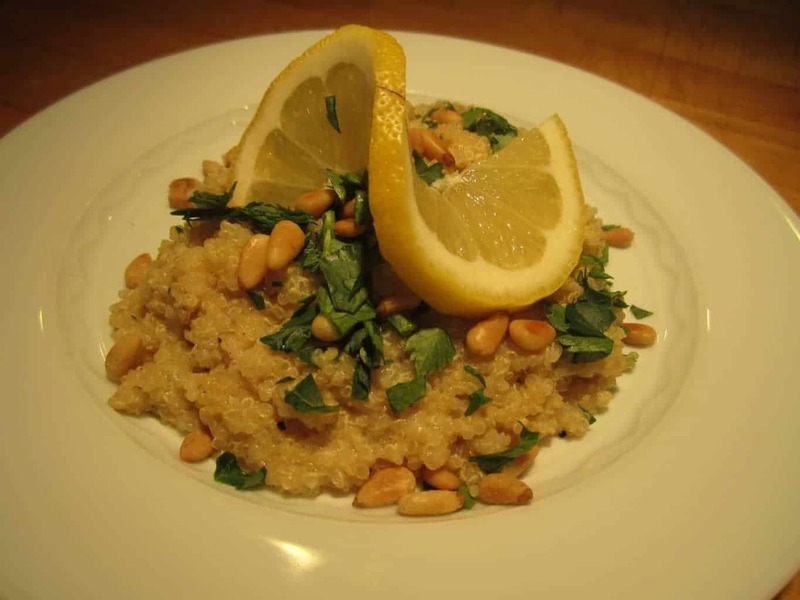 In the bottom of a large bowl, whisk together the tahini, lemon juice, grated garlic, salt and pepper. 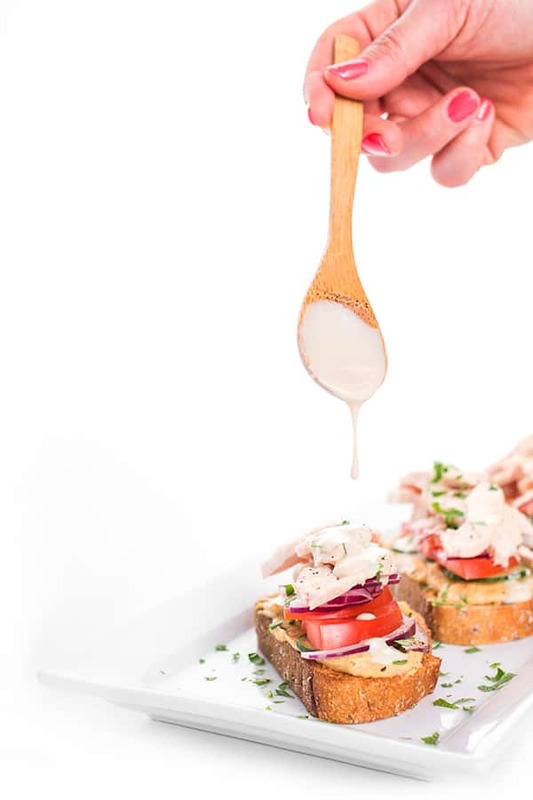 Slowly stream in up to 1/4 cup of warm water until you've reached a slightly thin and creamy consistency. Add chopped Brussels to the bowl and toss to coat in the tahini dressing. Stir in the dried cherries and toasted pine nuts; set aside. 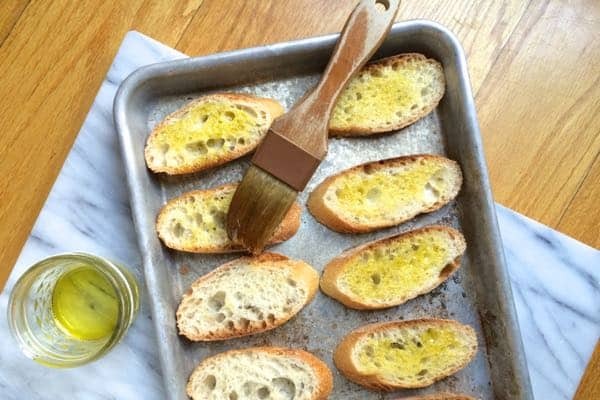 To prepare the crostini, spread baguette slices in an even layer on a baking sheet and brush with olive oil. Sprinkle with za'atar and a pinch of kosher salt. Bake until golden brown, 7-9 minutes. 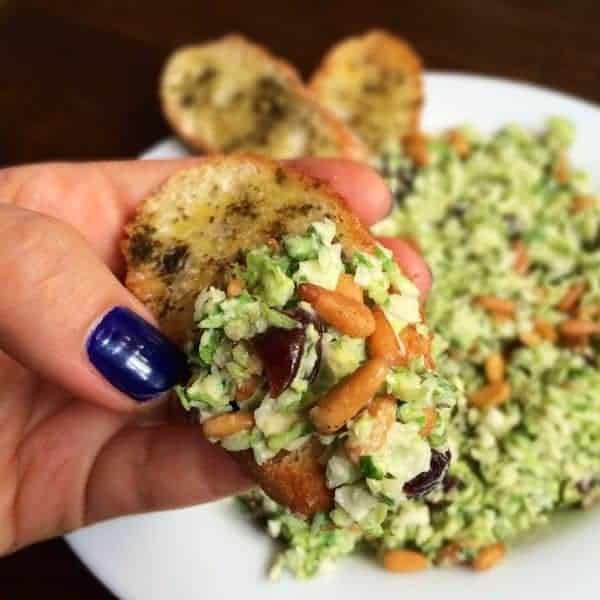 Serve Brussels slaw with za'atar crostinis. This brussels slaw tahini dressing recipe so extravagant:) I’m afraid I will not find the ingredients for this recipe! Thx for sharing Liz! I’m with you with the tahini. Love it – and this recipe looks great. I wish this salad was sitting in front of me right now. Yum! Brussels sprouts are one thing I have a hard time being creative with, and I always feel bad when they’re in season, looking good, and I can’t think of what to do with them. So, thanks for the wonderful, unique idea! Can’t wait to try it. Yes I almost always roast them with bacon but I’m trying to be more creative! Tahini AND za’atar AND brussels sprouts. You’re really winning me over with this one. I don’t eat nearly enough brussels! This looks fantastic! This looks sooo good! I LOVE Brussels sprouts salads!